Home » Sulawesi culture » Pakarena dance : A dance that reflects the softness and politeness of South Sulawesi women. Pakarena dance : A dance that reflects the softness and politeness of South Sulawesi women. Dance is one of beauty form, tucked in body motion, eyes, and the dancer emotions. Perhaps, these reasons make the parents give their daughter's name with "Tari" and "Utari" in Indonesia. The aesthetic of beauty of the dance can't be doubted anymore and it will make the dance lovers be amazed. According to historical record, the art of dance in Indonesia is born simultaneously as a media of cult and offerings to their gods. However, along with the development of main function, dance is not only as a media of cult but also entertainment media. There's nobody knows exactly about the origin of this dance but the story that develop in the peoples of Gowa tells us that Pakarena dance comes from a myth, which tells two inhabitants of different lands, boting langi (from the kahyangan land) and inhabitant of lino (from the earth). Told that when the two lands were ready to be separated, boting langi taught lino inhabitants about the way of life start from how to grow crops, how to build and nourish husbandry until the ways to hunt the animals through the motions of hand, body, and foot. At the end, as a gratitude expression of the inhabitants of lino to the inhabitants of boting langi, the inhabitants of lino combined every motions becomes a dance named Pakarena dance. Pakarena Dance has beautiful aesthetic movement that you can see in every hand motion and foot motion. 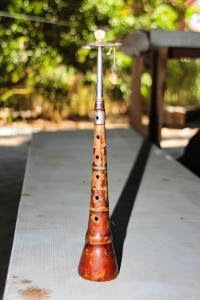 In the show, the dance is always accompanied by two tambours, kannong-kannong, gong, kancing, and a pair of puik-puik / tuip-tuip (flute) that is played by music players (7 men). To hit the drum, the players usually use drumsticks or "bambawa" that is made from buffalo's horn and also use both hands. The sound of the drums implies the strong character of South Sulawesi men. In other versions, the dance is also accompanied by song. Dance of pakarena is played by 4 until 7 women and the dancer must be woman. Why? Because of the dance, basically reflect the characteristic of Gowa women like soft, polite, faithful, and obedient. They accompany the beauty of pakarena dance by bright costume by the colours of red, white, light green, and yellow. The complete costume consist of 'baju pahang' (made of woven), lipa 'sa' be (typical silk sarong from South Sulawesi), and jewelries like necklace, bracelet, bun, and big size fan. Dance of pakarena is divided into 12 parts and it takes the time until one hour. Every motions implies particular meanings. The early motion is started by little sitting position and then rotates clockwise, this motion describe about human's cycle life. Then it's followed by up and down movements, reflect the wheel of human's life where sometimes it can be in bottom (in dismal condition) or sometimes in above (in happy). Perhaps, when you witness this dance or another dance, every movement is only a usual movement as a typical part of a dance but now you need to know that behind the motions, it implies the meanings, story, and message to be delivered. For the people of Goa and Makassar, this dance is already become a part of life and as a reflection of ideology. The dance is also as a media that is connecting them to God. The beauty of pakarena dance should be conserved and enjoyed because of its meanings. When you visit to Goa regency, Makassar, make sure you witness the sacredness the beauty of the dance. Don't be worried to find the show place of the dance because of many dance studio (sanggar tari in Indonesian) that you can see and visit in Makassar.